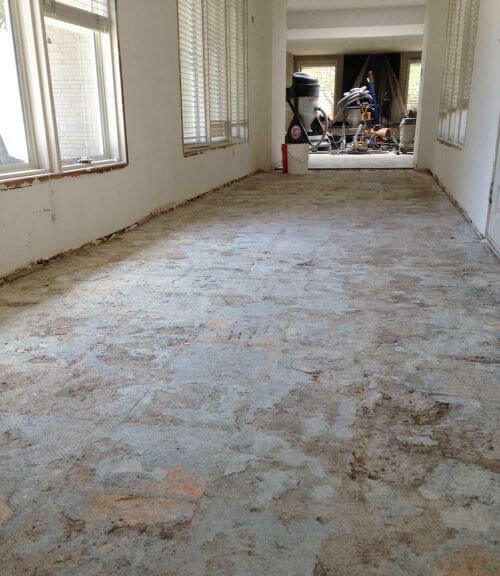 Mike and Lindsey have been going full steam ahead on their ‘House of Good Taste’ remodel, and today they share their secondary flooring material decision. 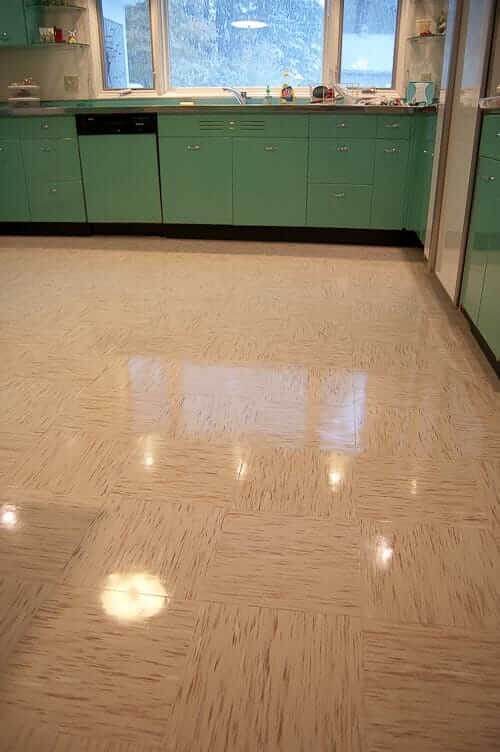 The couple appreciates the many good suggestions readers offered and — after much deliberation — they have chosen polished concrete as the finish for all of the non-terazzo flooring in their home. We never really warmed up to the idea of tile, not exactly sure why. Probably because the complete back half of our current home is tile and we are a bit bored with it. There are also what seems like a million tile choices, making it a bit overwhelming. Hallway concrete floor overlay process — phase 1. 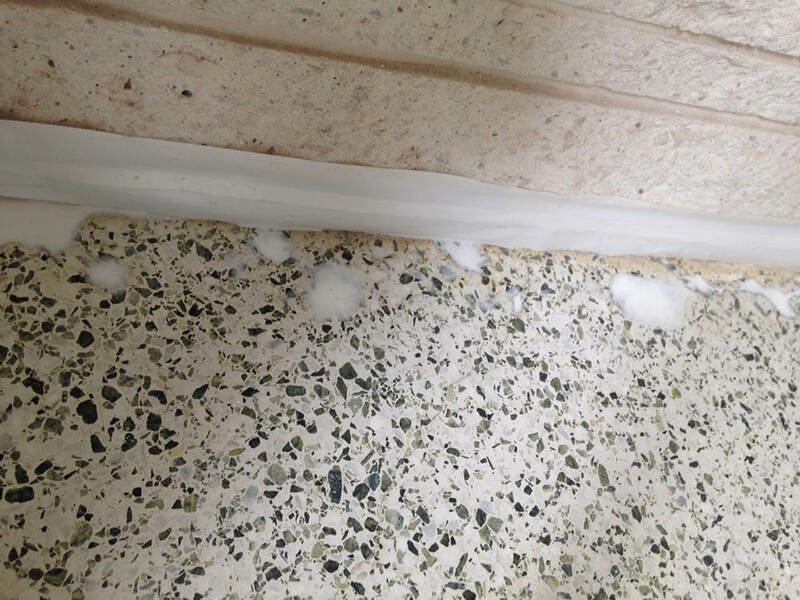 We had already called a few different companies about the terrazzo restoration, and luckily during this search we discovered a well referenced company that can do both terrazzo restoration and concrete finishing. Greg with Pro Surface Solutions turned out to be exactly the specialist we needed to get the job done. Hallway concrete floor overlay process — phase 2. After several meetings with Greg, we decided we both wanted and needed to do a full concrete overlay as opposed to working with the existing slab. The hallway leading into the house had be overlaid because the removal of the saltillo tile had left surface completely unusable. The slabs in the rest of the rooms were in varying condition, but most has significant cracks and issues. The kitchen had been tiled at one point, and we were told the tile lines would show through unless we did an overlay. Lastly, doing a overlay could also give us 100% completely flush transitions form the terrazzo and uniform finish from room to room. Hallway concrete floor overlay process — phase 3. 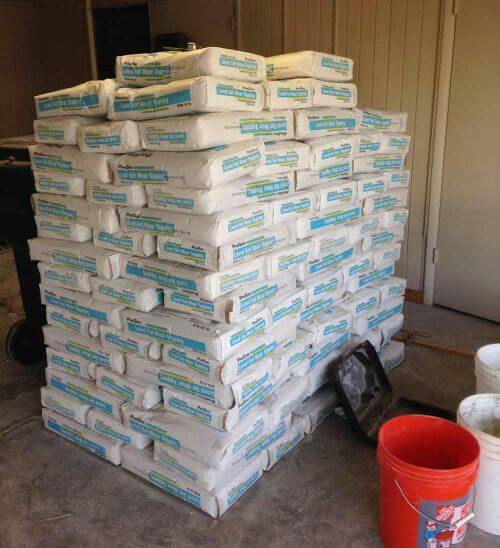 In our initial research on concrete, it seemed like a simple and cost effective solution. Even one that was a reasonable DIY project. But for what we were trying to accomplish, it was going to be a much more complex process — one best left to professionals. We wanted polished concrete not stained or epoxy coated, meaning that our surface is just diamond polished, treated concrete that results in an almost glass like feel and look. 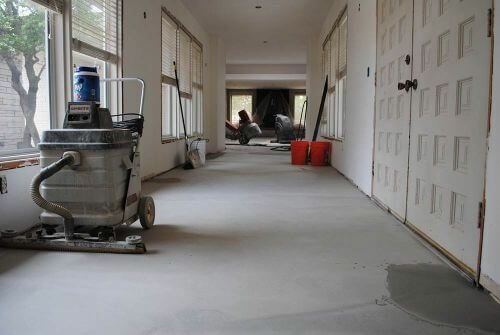 Hallway concrete floor overlay process — finished except for final polishing, which will be done just before move-in. Seeing the step-by-step transformation of the hallway really shows all the different steps it took to reach the finished look. 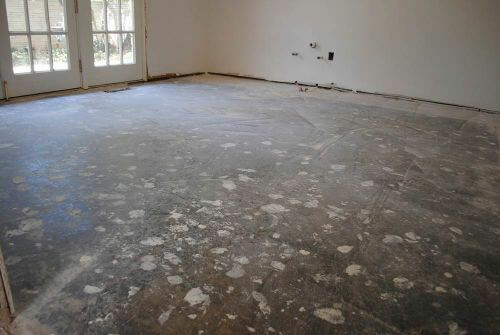 Kitchen floor before concrete polishing. 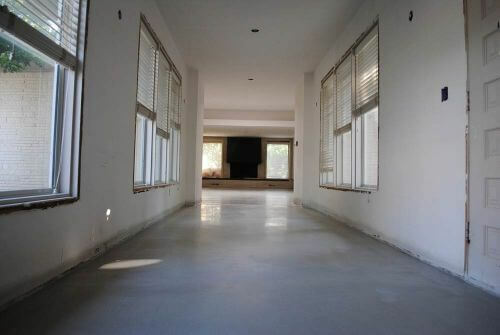 At this point, the polished concrete floors are not completely finished. They were taken to a certain level and then covered for the remainder of the construction. Right before moving in, the floors will be uncovered and the final treatment and polish will be applied. Polished concrete floor in the bedroom. Next up is the terrazzo restoration! 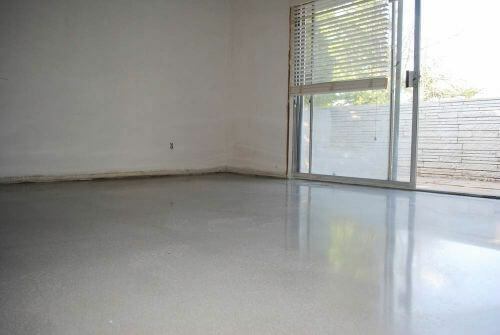 Read our 2012 story on Troy’s project to polish the concrete floor in his Eichler. Mike and Lindsey, the polished concrete looks great so far. It will be nice to see it all done next to your refinished original terrazzo flooring. Kudos to you for doing your homework, considering several different options and in the end meeting all your criteria for secondary flooring — well except for the inevitability of going over budget. We can’t wait to see how everything comes together in the end. 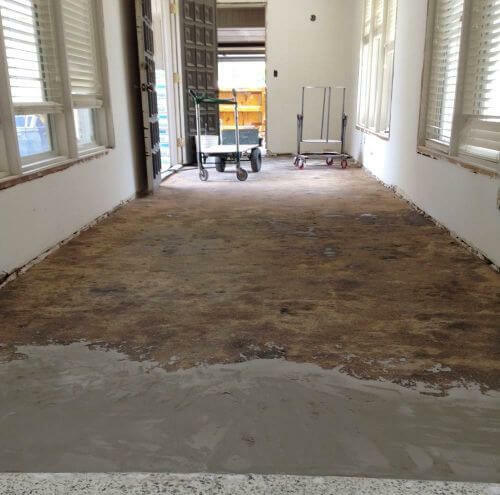 I had been giving a lot of thought to – when the time comes – replacing what was originally a tiled lower level family room with polished concrete. It’s such a great look – the initial photos look nice! I think it’ll be a great choice with terrazzo. Very appropriate and excellent choice. I originally suggested maple floors and Armstrong “Atmosphere” linoleum tile. I totally agree with not using the maple. Seeing is believing. I think you made the best decision since it looks spectacular and blends with the terrazzo. Another reader pointed out that these are not our decisions, we are along for the ride. What a wonderful ride. Most of us will never be able to have a home of this nature due to many factors. The most important factor being lack of availability. Thank you so much for sharing. 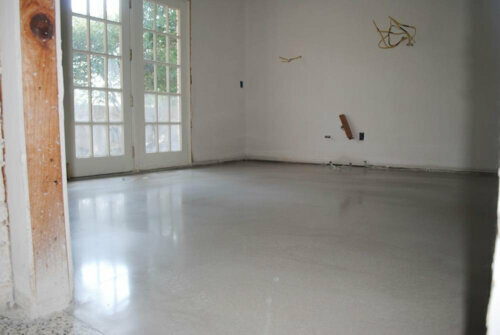 I am also planning on using polished concrete for my family room but was thinking of doing an acid stained finish. After seeing your pictures of the concrete I am thinking maybe the simple polished concrete is the way to go. I had similar requirements about transitions between rooms, easy maintenance and large dog friendly. Additionally I plan on staying in my home and aging in place so smooth transitions and easy maintenance make a difference. Just a side note. My parents bought the house a month before I was born, 1963, and I have lived here ever since. Still have the Ethan Allan Old Tavern Pine furniture and was able to purchase the furniture for the family room from an estate sale so it is the same vintage. I’d be interested to hear a performance report now, six months later, regarding the comfort of the cement floors. I’m wondering how it feels to stand cooking and cleaning in the kitchen on the cement? I’ve found that standing for long periods on the terrazzo is tiring to the feet and ankles. I hate ceramic tile in the kitchen for the same reason. We have the exact color terrazzo throughout the family room, bathroom and non-master bedrooms and the hallway that links them. 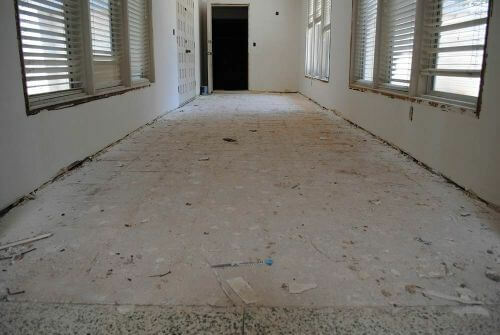 The foyer, dining room, kitchen and formal living room have cement covered in either tile or carpet. 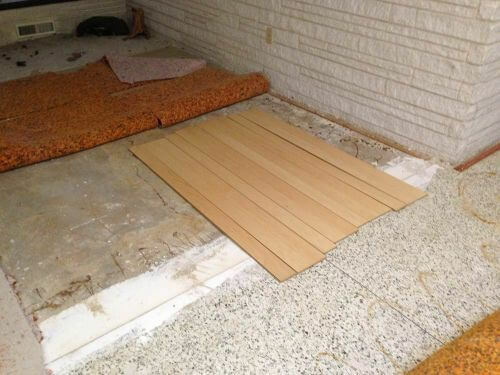 We have been in the same debate between polishing the cement and using hardwood or bamboo–there are a million engineered choices–and were leaning toward a darker or even gray-toned wood to work with the colors of the marble specks in the terrazzo. Any updates on the cement? Thanks for sharing. I also would be very interested in a performance report on the polished concrete. 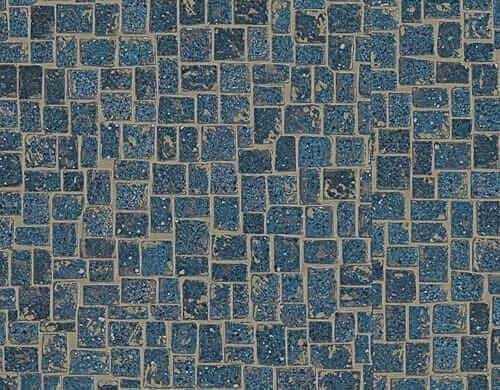 I can’t afford terrazzo, so I have been looking into terrazzo tiles. 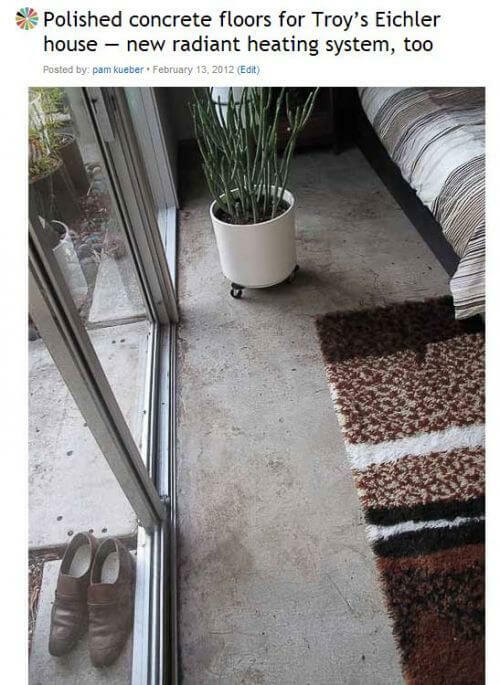 If I can’t afford that, the polished concrete seems like a good option. I originally decided against a concrete topping because I was afraid of spalling. Wondering if you’ve had any problems with that? Thanks for the information, it really does help to find the direction that is right for me with the restoration of my home. I think I have found cement terrazzo tiles that are affordable and sized large enough, 2’x2′, to achieve the look I was hoping for. Hoping that works out!